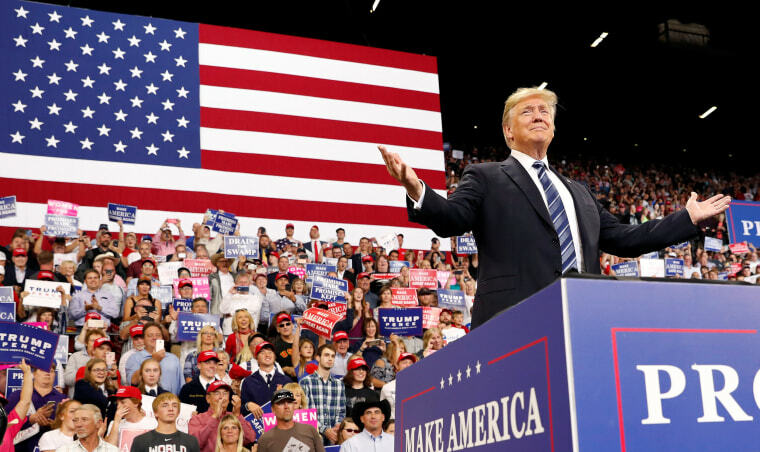 Analysis: The pre-midterms mood in the majority ranks is grim with President Donald Trump's approval ratings slipping and the poll edge for Democrats increasing. WASHINGTON — The political numbers look bad — very bad — for President Donald Trump and congressional Republicans less than two months from the midterm elections. Or, in the succinct estimation of one veteran GOP strategist to NBC News, the House GOP is already "screwed." Several reputable polls released in the last week have placed Trump's approval rating below 40 percent, meaning there aren't many people outside his base who think he's doing a great job. Recent generic ballot surveys, which measure whether voters want Republicans or Democrats in control of Congress, have pointed to a Democratic advantage ranging from 10 points to 14 points. Polls in several individual House and Senate races in states where Trump romped to victory in 2016 show tight races. And Fox News polls in five Senate races in states where Trump won — North Dakota, Missouri, Arizona, Tennessee and Indiana — show contests within the surveys' margins of error. The timing for the GOP is abysmal — these are the first numbers in the post-Labor Day period when candidates begin ramping up their campaigns for the midterm election home stretch, and voters traditionally start to pay attention to the choices in their home districts and states. Tom Davis, a former chairman of the National Republican Congressional Committee, said that polling is likely to bounce around between now and the Nov. 6 elections, and that things could get better for Republicans if they are able to talk up the strong economy rather than being redirected by Trump's undisciplined messaging. But, he said, "the bad news is, it can also get worse." Right now, the Republican strategy for holding onto power in the House smacks of desperation. Trump has used the specter of impeachment to fire up supporters at rallies, and he recently told a group of evangelicals at a private meeting that there could be "violence" if the House flips. Steve Bannon, who was chief executive on the Trump campaign and who regards himself as the guardian of Trump's "populist nationalism," has produced a slick film, "Trump @ War," that aired on the One American Network this week and is aimed squarely at motivating the Trump base to go to the polls. It opens with scenes of violence in the streets — blamed on the left — shows short clips of Trump at his best, and features cameos by Trump-orbit luminaries Corey Lewandowski and Sebastian Gorka. And the Congressional Leadership Fund (CLF), a super PAC tied to House Republican leaders, is bombarding the airwaves in swing districts with negative ads designed to depress enthusiasm for Democratic challengers more than boost Republican incumbents. In one, running in New Jersey's 7th District, the fund accuses Democrat Tom Malinowski, a human-rights advocate and former State Department official, of having lobbied "for terrorists' rights" because Human Rights Watch, where he was executive director, advocated for suspected terrorists' having access to U.S. courts and for a prohibition on torture by the U.S. In another ad, CLF says Democrat Abigail Spanberger, running against Republican Rep. Dave Brat in Virginia's 7th District, taught at an Islamic school called "terror high." Spanberger, a former CIA officer, fired back that CLF had improperly obtained and used information from her federal security clearance application to launch the attack. Of course, polls are snapshots and there's a long time — nearly eight weeks — between now and Election Day. Trump is also coming off a few particularly terrible weeks for his political narrative, which included the publication of Bob Woodward's book "Fear," detailing chaos in the administration, a book by former White House official Omarosa Manigault Newman that suggested the same, and an op-ed article in The New York Times, written by an unnamed senior administration official, that contended some of Trump's aides work to undermine his worst instincts. "There’s going to be constant changes between now and the crux of Election Day," Tom Reynolds, another former chairman of the National Republican Congressional Committee, said of the mood of the electorate. "These people are still not paying attention to what they will in that second week of October." But Trump and his fellow Republicans will need a course correction — and fast — to fight the tides of history and current polling that suggest the GOP is in danger of losing its majority in the House and possibly the Senate. Republican donors and strategists are increasingly nervous about Sen. Ted Cruz's ability to hold a once-safe seat in Texas as he tries to fend off the insurgent campaign of Democrat Beto O'Rourke. Mick Mulvaney, the director of the Office of Management and Budget and a former House Republican from South Carolina, told GOP donors over the weekend that Cruz could lose essentially because he's not likable enough. The Trump effect may be different in Senate races than it is in House races, said a veteran Republican strategist who has worked on campaigns in both chambers, because Trump remains popular in most of the states where Republicans are trying to knock off Democratic incumbents. He is in the midst of barnstorming states where there are competitive Senate contests, including Montana, West Virginia, Indiana and North Dakota. He was forced to cancel a planned trip to Missouri to campaign for Josh Hawley, the Republican challenger to Democratic Sen. Claire McCaskill, so that he could monitor the federal response to Hurricane Florence, but he is expected to reschedule. But House Republicans are defending many seats in traditionally Democratic-leaning states, including California, Illinois and New York, where Trump lost the presidential vote and is still unpopular. And while Trump benefits from having his rallies broadcast into other states and districts, that can backfire when his words reach voters who are turned off by them — or, worse, motivated by them to vote against the local Republican House member. "The House is screwed," the veteran GOP strategist said. Asked whether that means Republicans have already lost the chamber, he said, "If the election were next week, absolutely." Davis said if Trump can discipline himself and help keep candidates focused on the strong economy — rather than his incessant tweeting and books by Woodward and Manigault Newman — they can recover ground. "The biggest Republican problem is message discipline coming from the White House," he said.